The opinion poll prime ministership is a modern Australian disease. Not only does it suggest an ailing in the Westminster system, but a profound contempt for the democratic sensibility on the part of party representatives, hacks and the industry that supports them. Prime Ministers are merely the icing, to be whipped off and replaced on going stale. Little wonder that the Australian politician can never be permitted to be an authentic representative, ever hostage to sentiment and the astrological deceptions of polling. This conditioning is so total it has even bewitched the journalistic classes, who have also done their best to feed the complex of the short-term prime minister. Twenty-four hour news tends to do that. A veteran ABC journalist let it slip on Monday morning that the elections were about the party strategists, the politicians and the polls. It was easy in such an assessment to avoid the Australian voter, whose relevance has declined as the influence of party brokers has risen. A canon of politics is that support expressed with fervent enthusiasm in the public domain is bound to reverse behind closed doors. Prime Minister Malcolm Turnbull has the firm support of numerous members of his front bench, expressed publicly. This is exactly why he should be worried. Such enthusiasm could be lethal. Turnbull had done himself no favours. He remains weak but more to the point, has appeared to be weak. He took his party to the last federal election and received a thumping which imperilled his majority. He has been unsuccessful holding the sniping conservatives within his ranks at bay while embarking on an obsessive campaign to wound the opposition leader, Bill Shorten. The latter aspect of this strategy failed to materialise in the last round of by-elections which saw no Coalition gains, notably in the Queensland seat of Longman. As Queensland promises to be critical in any future election for the fate of the Coalition government, strategists are getting tetchy, eyeing Dutton as a form of insurance. What will take its place remains to be seen, but the environment is bound to find a subordinate position in any such scheme. Climate sceptics remain irritations with purpose. The current form of the plan has been watered down: instead of legislation, the target will be set by an executive order of the relevant minister. The Australian Competition and Consumer Commission would also tailor a report to parliament on the impact on prices as a result of the reduction. Former prime minister, the deposed Tony Abbott, is excited. The great disrupter smells blood and revenge, and even though he is unlikely to take Turnbull’s place in the event of any leadership challenge, he is having a vicarious thrill. After the party meeting on August 14, Abbott landed a right royal blow, suggesting that “most explanations of how the NEG (as it stands without price targets) might theoretically get prices down sound like merchant bankers’ gobbledigook.” He is seeing the leader of his party being readied for execution. Fitting – Abbott was himself knifed by Turnbull in 2015 as being of questionable competence, notably on matters economic. The media vultures have done little to stem the tide, parasites finding value in the speculation fanned by the Coalition dissidents. Newscorp has willingly supplied the soapbox, effectively arming them with weapons of sabotage. 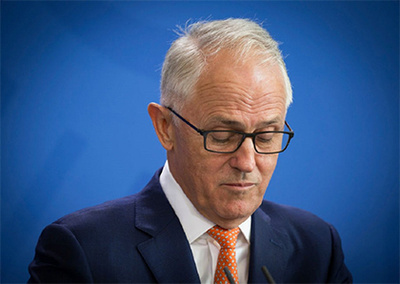 With each suggestion of a leadership spill come manuals – one supplied by The Sydney Morning Herald – on how to approach a prime ministership that awaits early termination. As this week goes on, this may have simply been another spat in Turnbull’s unsteady term, wishful thinking on the part of the rabblerousers whose world view is markedly clipped. But a prime minister without authority can only ever be a prop for other forces who will, eventually, seek his removal. This state of affairs again shows the decrepitude of Australian politics, marred by a special form of impermanence mired in revenge, provincialism and ill-gotten gains.